There are worry lines all over the face of M K Bhojan, a small tea grower in the Nilgiris district of Tamil Nadu. Tea prices have fallen cataclysmically in the last few years, affecting small farmers like Bhojan most acutely. In 1997-98, one kilogramme (kg) of green tea leaf fetched as much as Rs 21. And it was possible to make Rs 80 from one kg of processed tea at auctions. Today, prices of green tea leaves have fallen to a paltry Rs 3 to Rs 5 for a kg (the price of the processed tea has gone down to Rs 30-Rs 43 per kg). "That was the price I got in 1977. But then, labour and fertiliser costs were much less and I could make a small profit. The same price today spells doom for us," laments Bhojan. 89,000 hectares (ha) of land in the Nilgiris, amounting to 80 per cent of the cultivable area, is under tea cultivation. Of that, 42,000 hectares are cultivated by small farmers. "The average holding of a small tea-grower is estimated to be around 0.6 ha," says Vikram Kapur, executive director Tea Board, Coonoor. These small growers sell their tea leaves to the brought tea leaf factories (BLTFS), which process the leaves and sell the 'made tea' at auctions. Four kgs of green tea leaves are needed to make a kg of 'made tea'. The price paid to the farmers for the leaves is determined in auctions in a backward flow. For instance, if 1 kg of made-tea realises Rs 33 at the auction, the BLTF takes Rs 15 and the remaining Rs 18 goes to the tea-farmer (who thus gets Rs 4.5 per kg of leaf). Of the 200 million kg tea produced annually in South India, 75 million kg is supplied by the Nilgiris small farmers. So, it is hardly surprising that they are the worst hit by the crisis. Large tea estates in the Nilgiris also faced problems. But they could tide over by lowering wages of labourers. The threat of the estates getting closed and consequent unemployment led labour unions to take a cut in wages. Says M Manickam, president, Anna Plantation Workers' Union, a prominent union in Coonoor, "The labourers were getting Rs 76.85 per day. But in 2002, seeing the crisis, we negotiated and accepted Rs 72.25 per day. But this is only for two years." The government came forward with large incentives. Says Bhojan, "The Tea Board and the United Planters' Association of South India (UPASI) offered us Rs 15,000 per acre to convert from vegetables to tea". Growers also recall that they were paid a subsidy of 50 paise per tea sapling planted -- so they had to spend just 50 paise per sapling themselves. The boom coincided with a disease, which hit potato cultivation. So many a Nilgiri farmer converted enthusiastically from vegetables to tea. Predictably, the government's calculations went totally awry. Indian tea exports to the Soviet Union were governed by a special bilateral trading arrangement called the rupee trading system, which allowed payments in non-convertible currency. The collapse of the Soviet Union led to a termination of this system. In 1993, an Indo-Russian treaty mandated the conduction of all bilateral trading agreements on a hard currency basis. And tea exports were among the most hit by this. Moreover, the World Trade Organization (WTO) regime ensured that there were other entrants into the Russian tea market such as Vietnam, Kenya and China which could supply tea at much lesser price. For example, China supplies tea at an incredible Rs 16 per kg (the auction price of the Nilgiri tea ranges between Rs 33 and Rs 47 per kg). There was one good year -- 1997-98 -- when the fortunes of the Nilgiri tea seemed to be reviving. Prices for a kg of green tea leaves went up to Rs 21 that year. But the revival sparked by a failure of the Kenyan tea crop that year proved to be short-lived. Despite a Memorandum of Understanding between the Indian Tea Board and the tea associations of Russia to facilitate an export of 100 million kgs of tea annually, Russia reduced its tea intake from India. In 2001, it exported 67 million kg; this declined to 47 million kg in 2002. The fall in demand had a direct bearing on tea prices. The distressed farmers took to the streets in 2000, courting arrest and burning buses, to draw the attention of the government to their plight. The central government promptly granted a price subsidy of Rs 2 to the small farmers for a period of six months, implying that the crisis might be temporary, which of course it wasn't . Tea exports continued to fall: in January-April this year, the export figures for South Indian tea were 41 per cent less than the figures for the corresponding period last year. Why couldn't the industry quickly identify and develop new markets? The huge demands of the Soviet market had fostered complacency and indiscipline in the Nilgiris tea industry; quality was given short shrift (For an exception see box: Not with the crowd). "Making tea for other markets requires fine succulent leaves for which meticulous attention has to be paid to the process of plucking and manufacturing," says Kapur. The best tea is made from plucking two leaves and a bud. But tea cultivators can obtain increased productivity by coarse plucking of three leaves and a bud and sometimes even more. And this is what the small tea cultivators resorted to. "A grower has to prune the bushes once in 4-5 years to maintain quality in the leaf. But since the Russian kind of manufacture didn't demand pruning, people didn't prune for 10-12 years," explains Kapur. And in today's crisis, nobody has got the funds or the ability to do it. Small tea growers also have to employ labourers if they have to pluck in a disciplined manner, something they are loath to do. The small tea growers lay the blame at the door of the BLTFS. Says A Bhoopathy of the Kotagiri-based Nilgiris Tea Protection Centre (NTPC), "It is the BLTFs who are responsible for giving Nilgiris tea a bad name. They adulterate the product with tea waste and low quality sugar to make it more bulky." Adds Bhojan, "If the tea leaves we provide are so bad in quality, why don't the factories reject them outright? After all, that is their right. If there is no demand, there should be surplus tea lying around. Where is it?" The auction system also draws flak from tea growers. "96 per cent of teas produced in Nilgiris are sold through auctions. The producers just haven't explored alternative avenues," says T Udayachandran, chairman and managing director Indcoserve, an apex body for tea cooperatives in the Nilgiris, who maintains that the auction system is not transparent. "It is so buyer-dominated that it takes only 20 seconds to knock out one lot of tea," he says. To redress this, the government plans to set up an auction centre at Coonoor. "75 factories have affiliated themselves to this centre. It will become functional by September," says Udayachandran. Meanwhile, the NTPC is trying to get a minimum support price of Rs 15 per kg of green tea leaf. It has filed a petitioned to the Madras high court for this purpose. The tea board they say is is vested with powers under the Tea Act, 1953 to fix a minimum support price for small teagrowers. Under similar circumstances the centre had fixed a minumum support price for rubber, under section 13 of the Rubber Act. The same concession should be extended to tea, contends NTPC. The small tea grower's woes have been compounded by a decline in productivity per acre in recent years (See graph: Declining yields). Bhojan says that ten years back, he could get up to 6,000 kgs of green leaves per acre; today this has fallen to less than 4,000 kg per acre. Correspondingly, the cost of fertilisers has shot up. Ten years ago, 100 kgs of fertilisers cost Bhojan Rs 400; today he has to shell out Rs 700 for the same amount. On an average he requires about 1,200 kg of fertilisers per acre of land in a year. Pointing out the reasons for this decline in soil fertility, M Selvaraj, head, Horticulture Research Station, Ootacamund, says, "The soil has become highly acidic in many places and has a ph of around 4 due to continuous chemical fertiliser application." "Intensive cultivation with the chemical inputs has led to complete cessation of the beneficial microbial activity in the soil system and emergence of new pest and diseases" he adds. He claims that the farmers of Nilgiris are still using some weedicides regularly, which have been banned by other countries. Nilgiris has 125 pesticide dealers who give pesticides on credit to the cultivators. "Rs 27 crore is due to the pesticide companies from the farmers," notes the horticulturist. According to Selvaraj, 50 per cent of the area under tea can be converted for organic farming, so the cost of cultivation can be reduced. He feels that every small farmer should have 1 or 2 cows, which would provide natural fertilisers to the farmers. The horticulture department has even submitted a proposal to the state government to convert the Nilgiris into an organic farming district. And some small growers have also experimented with biofertilisers and gone organic with success (See box: The organic way.) "But biofertilisers have to be mixed with manure and where do we go for it?" asks Bhojan. The monocropping pattern drastically decreased fodder cultivation in the Nilgiris which resulted in a fall in the cattle population -- Bhojan's grandfather owned 150 cows; he has none. Consequently, farmers are not able to apply manure for their crops, leading to reduced yields. The Save Nilgiris Campaign (SNC) -- which began when the tea boom in the Nilgiris was in full swing -- had warned of the perils of monoculture in 1988. It had stated: "It is a scientific fact that any monoculture, including tea, is harmful for hill areas like the Nilgiris whatever be their immediate economic benefit. A similar mistake was committed in the 1950s and 1960s when eucalyptus was indiscriminately propagated all over the district. Its harmful effects are felt now and reversing the situation has become extremely difficult". 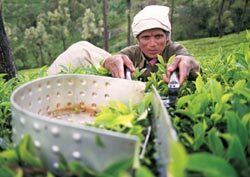 Intensive fertiliser and pesticide use has also contributed to a fall in the market appeal of Nilgiris tea -- especially in quality conscious markets like Europe. Several countries and international organisations have established the Maximum Residue Limits (MRL) of a number of pesticides on tea. Adhering to those standards may prove to be a tall order for the Nilgiri farmer. For instance, the European Union (EU) prescribes a MRL of 3 parts per million (ppm) for a vital pesticide, ethion. "Reducing ethion levels to less than 3 ppm would be very difficult, for mites are a big problem in the area," explains N Muraleedharan, director, UPASI-Tea Research Foundation (TRF), Valparai. But on a positive note he says "we have found that the tea brew doesn't have even 0.5 ppm. So we have asked the EU to take into consideration the residue in the brew and not the black tea. 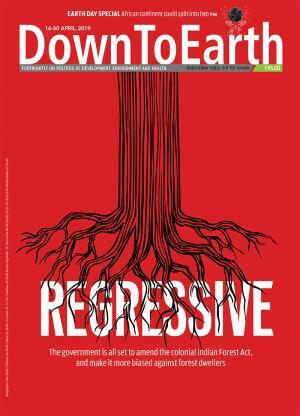 "Muraleedharan who met the European Tea Committee, last June, "requested the Committee to take into account what leaches into the brew that one actually drinks," he told Down to Earth. Adds R Selvasundaram, head, division of entomology, UPASI-TRF, "There are more than 300 pests afflicting tea in South India alone. We are trying out integrated pest management methods using non-chemical ways to control and prevent pests. Pesticides can be a second level treatment." The small farmers say they are now caught between a declining export market (both in terms of quantity as well as prices) and a buyers' cartel, which hardly reflects the real demand for tea. The import of foreign teas, following the WTO agreement has depressed the Indian market, they feel. But dismissing these arguments, Kapur asserts, "Last year we imported 20 million kg, a very small figure compared to our total production of 850 million kg". He also debunks the theory of the influx of cheap Sri Lanakan teas working to the detriment of the Nilgiri farmer. "The average price of such imports is Rs 85-87 per kg, which means these teas are definitely high priced orthodox teas and India is basically a CTC market. So where is the threat?" he asks. Since July 2000, the government has made some efforts at helping farmers improve the quality of their tea, so that new markets can be tapped. "We have visited 200 villages and educated growers about the need to do quality plucking to compete in the international market," says S Ramu, senior scientist and training organiser, UPASI-KrishiVigyan Kendra, Coonoor. "Due to the efforts of the past 3 years, growers are now able to realise Rs 2-3 higher than the prevailing prices, "avers Kapur. "There are factories today which are able to get Rs 10-15 higher than the market average because of the changes carried out, thanks to this programme," he adds. There are also subsidies for replanting. "Wherever there are very low yielding sections in gardens, this could be uprooted and planted with clonal material so that we can get higher yields," says Kapur. The Tea Board also provides Rs 62,000 per ha, as direct cash subsidy. "Our target is every year 2 per cent of the area should be replanted. But the crisis has not allowed us to replant even 0.5 per cent of the area every year," he laments. The tea board is also trying to develop new markets. But undoing years of dependence on one market and almost no promotional activity is not easy. Says P S Sundar, journalist, and a long-time observer of the tea industry in Coonoor, "The industry says we don't have money for promotion, let the tea board give. The tea board says we don't have money for this, the industry has to plough back part of its profit on promotion." An initiative was taken recently to market Indian tea in Pakistan. Pakistan is the world's third largest importer and takes 150 million kg of tea ever year -- mostly the CTC variety. Kenya is its main supplier. Indian exports to the country are just 3.7 million kg every year. Are political considerations the main reason? Sundar disagrees. "I am convinced that more than politics, they want good quality CTC tea and if Kenya has been providing them that at low prices, why should they shift loyalties?" he asks. Feels T Rangiah, former chairman, Indcoserve, "It is better to promote domestic consumption. Stick to quality tea and get rid of all the substandard stuff and automatically, production will come down." Sundar calls for additional marketing savviness. "The accent should be -- tea is a good, healthy drink, so consume it. Go more on the merit of tea than on mercy to the farmer . " According to J Lakshmanan of NTPC, all it needs is India's own per capita consumption of tea to increase from 0.66 kg to 0.83 kg. "Then there won't even be the need to export," he says. The government is also gearing up with quality parameters. A crude fibre content rule is being framed under the Prevention of Food Adulteration Act (PFA), 1954 which will basically strengthen the field practices. "The change in PFA and the strict implementation of International Standard Organization (ISO) and Hazard Analysis and Critical Control Point (HACCP) and the well-known ISI mark from the Bureau of Indian Standards is very important," says Sundar. In the post-WTO regime, teas without ISO and HACCP certification would be out of the shelves in the developed and cash-rich countries. The EU, US and Japan have already started insisting on the HACCP certification from tea suppliers. Is there an alternative to tea in Nilgiris? Selvaraj feels that mushrooms could be one. Ramu however questions any move towards alternatives. "Vegetables are very costly. Tea is a perennial crop and it will be tough to switch to annual crops like potatoes," he says. Environmentally too, some feel tea to be a better alternative than vegetables. Says M Madhu, senior scientist, Central Soil and Water Conservation Research and Training Institute, Ootacamund, "If tea had not been there in the Nilgiris, most of the soil would have been in the Bhavanisagar dam." The SNC has a different point of view. During the days of the tea boom, the campaign had advocated, "Small growers should be encouraged to bring back at least one tenth of their land under horticultural crops. That would protect them against market fluctuations and also provide assured sustenance." This they feel holds good today as well. What has emerged starkly from the crisis is that old ways will not work. Kapur sees a positive aspect to the crisis. "I think the crisis is a belssing in disguise. The South Indian tea industry will emerge stronger from this" he notes For that to happen the industry will have to mend many ways.